I came across some beautiful artwork a few days ago, Tolkien inspired art that truly impressed me. The artist's name is Jian Guo. He is known as breathing2004 on deviantArt. I am always concerned with mythical, mystical spiritual inspiration in art, music and literature. The world around us, the universe we live in is filled with mystery and opportunities for devotion or simply appreciation. 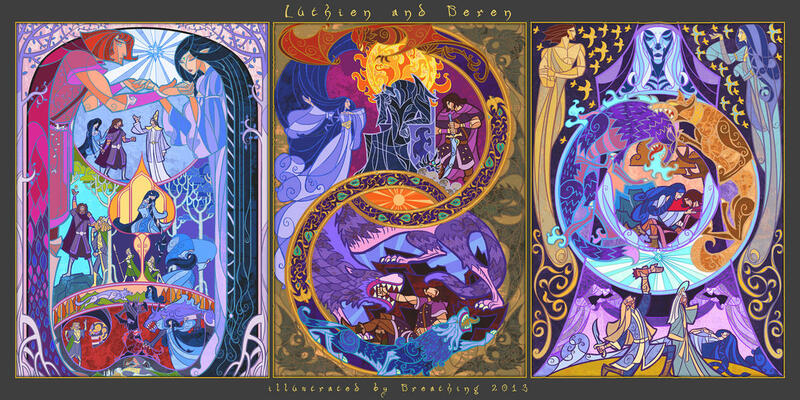 Jian Guo's stained glass-like art, especially his Tolkien inspired pieces are simply glorious to behold, distinctive and beautiful. As others have said about his work it falls somewhere between stained-glass art and medieval style art work. Tolkien himself mentioned that all of us who create are merely sub-creators and that any gifts we have come from the grand creator, God himself. All our gifts come from that Holy and Divine genius. If you would like to buy Guo's work you can go here. Find all of his collection on his deviantArt page. Enjoy! Written by V.A. Jeffrey On October 13, 2013 In "art", "book covers", "fantasy", "fiction Sci-Fi"